Durante il dialogo tra il Dott. Molino, psicoterapeuta, e il Dott. Boccuto, ricercatore presso presso il Greenwood Genetic Center si passeranno in rassegna le ultime scoperte in tema di autismo con un occhio anche alla clinica e al contesto sociale. 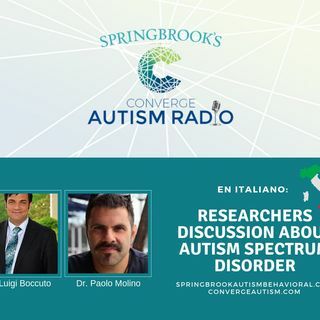 Join Dr. Luigi Boccuto to discuss the latest research on autism spectrum disorder with Dr. Paolo Molino. This show is in Italian. Dr. Boccuto is a clinical geneticist who trained for several years under Professor Neri in Rome with a focus on ... See More in hereditary cancer, overgrowth syndromes and intellectual disability (ID) syndromes. Dr. Boccuto is currently an assistant research scientist at the JC Self Research Institute of the Greenwood Genetic Center. His main projects are focused on the study of the genetic causes of autism, ID, and conditions with segmental or generalized overgrowth. He is also characterizing the metabolic profiles of cells from patients with overgrowth, autism, ID, and other neurodevelopmental disorders. Dr. Bocutto will be presenting this year the Converge Autism Summit sponsored by Springbrook Autism Behavioral Health. Dr. Paolo Molino resides and practices in Florence, Italy. He works with patients all over the world in his native Italian, English, French, and Spanish.